If you're going to come for the queen, you best not miss. Oprah Winfrey posted a loving tribute to the late Maya Angelou on her Instagram on April 4, 2019, which would have been the former poet laureate's 91st birthday. 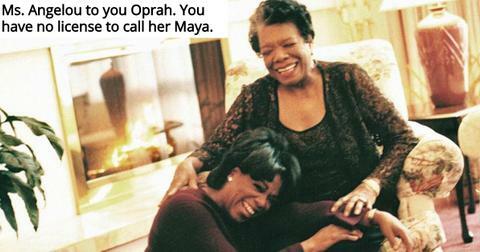 The photo shows Oprah collapsed in a fit of laughter at Angelou's feet as the I Know Why the Caged Bird Sings author holds her and laughs along with her. It was a beautiful tribute to a special woman. It's been five years since Angelou passed away, and it's clear she and Oprah had an intimate friendship over the years. Nevertheless, one well-meaning fan of the poet's seemed to be offended by the talk show legend addressing her by her first name. "Ms. Angelou to you Oprah. You have no license to call her Maya. She will always be Ms. Angelou." So I see a couple problems here. First off, It's a bit ironic to criticize Ms. Winfrey for being overly familiar in the same breath you address her as Oprah. Especially when the billionaire certainly had more of a personal relationship with Ms. Angelou than this random commenter does with either of these inspiring women. Not to mention, it's a bit tacky as a response to a clearly heartfelt tribute, which included the poem "Death Is Nothing at All" by Henry Scott Holland. The beautiful verse is a mainstay at funerals, but a fitting way to commemorate the life of another inspiring poet. Though Oprah doesn't often comment directly to her critics online, she was sure to set the record straight in this particular instance. Rather diplomatically, the 65-year-old responded. 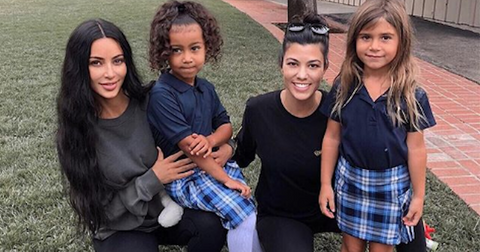 "She actually game me permission after the 2nd or 3rd visit to her home to call her "Maya". Believe me I've witnesses when other folk did NOT have that permission!" However, the allusion to multiple visits to Ms. Angelou's residence was a rather subtle way of telling this gentleman to take several seats. Predictably, a lot of commenters were less kind to "polo.daily," who, to his credit, seemed to take those lumps with poise. But seriously, my man, anyone with a tiny bit of familiarity with Winfrey and Angelou's history would assume those two were on a first-name basis. On her passing, the media mogul called the poet "my mentor, mother/sister and friend." "She was there for me always, guiding me through some of the most important years of my life," she wrote hours after Angelou left the Earth. 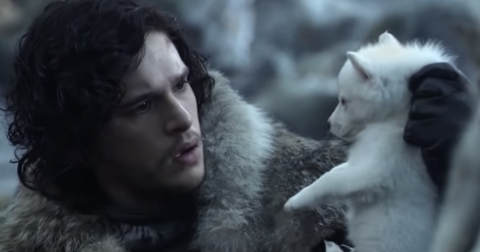 "I loved her and I know she loved me. I will profoundly miss her. She will always be the rainbow in my clouds." Then John Mayer jumped in the fray for some reason? 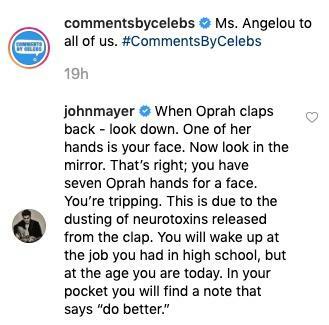 The comment exchange was picked up by the @commentsbycelebs account, which clearly has a follower in singer John Mayer. He rang in on this impertinent follower with his own clapback. He wrote, "When Oprah claps back - look down. One of her hands is your face. Now look in the mirror. That’s right; you have seven Oprah hands for a face. You’re tripping. This is due to the dusting of neurotoxins released from the clap. You will wake up at the job you had in high school, but at the age you are today. In your pocket you will find a note that says 'do better.'" Not 100 percent sure what he was on about there, but I think the general gist is "you are not fit to breathe the same air as Oprah." Other celebs ignored the drama, instead focusing on the true purpose of this post: honoring the memory of an incredible writer, teacher, and spirit. Rest in power, Ms. Angelou.